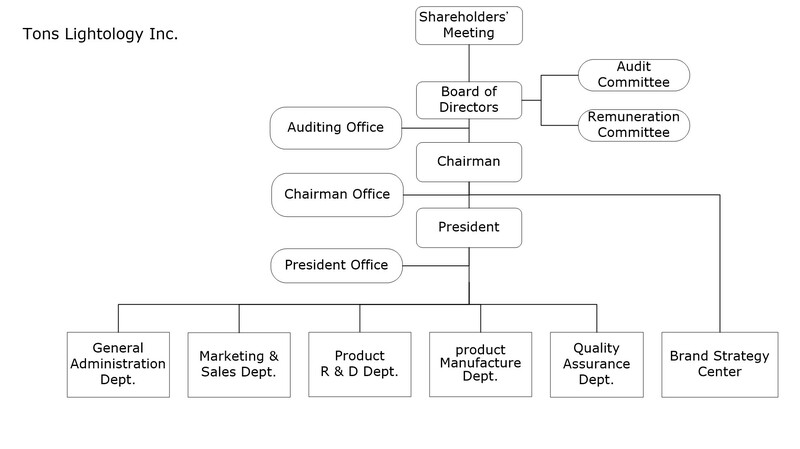 Auditing Office -to audit all business execution circumstances of each unit, the sales, purchasing, production, payroll, finance, fixed assets, investments, computer and research and development affairs. -to recommend for improving internal controls, internal audit and other related matters. Chairman Office -to assist in Board Meeting related issues. -to perform routine tasks assigned by Chairman. President Office -Collect all kinds of business intelligence, analysis of industry trends, trends for decision making, and a variety of programs to assist program. -to establish the company management system, to assess the operational management and integration of the various departments plan to ensure business objectives of reaching. -Set up company operating principle and track management indicators. -Review and advice to modify the company’s organization structure, rules of personnel management, and other important human resource matters. -Plan and implement human resource policies to reduce relevant risks and maintain employee relationship. -Handle the affairs of general services and legal affairs. -Cope with all affairs relating to information operation system, office automation, internal and external website applications and information security to the needs of operation. -Handle all accounting matters including the costs, accounts, taxation to ensure management efficiency of the company’s operation, and adherence of related accounting regulations to reduce company operation risks. -Responsible for operational financial strategy, investment strategy, financial management and strategy, dividend strategy as well as investor relationship in order to minimize financial exposure, uphold financial opportunity and maximize shareholders’ best interest. -Commodity management, planning, design and promotion. -to develop new product specifications, assess the feasibility of the development, and take control of the schedule of the development. -Development of product marketing strategy and pricing strategy. -perform market and product trends surveys. -Set up annual business operating goals and plans. -ODM and OEM product sales plan and execute the project. Product R & D Dept. -Responsible for the development and commercialization of the research project of the new products. -R & D project integration and management. -Plan for Intellectual Property Development. Product Manufacture Dept. -Responsible for the operation of logistics supplies, including procurement, materials management and production scheduling and other matters. - Responsible for all product manufacturing. - Control the manufacturing yield and the production planning to achieve all goals of efficiency. -Production coordination of manufacturing resources and complete shipment targets. -Implement the quality management system to ensure the product quality and meet customer needs. Quality Assurance Dept. -Responsible for establishing quality control systems, follow up and deal with a variety of quality issues. -Responsible for the implementation of ISO system, IQC management and product management of IPQC and OQC. -Pursue and implement education and training related to QA management system and quality system of planning.